Are you searching for the simple and stylish covers that can really help your project report shine? Look no further, the ideal covers has arrived. 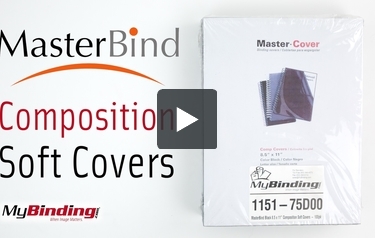 The MasterBind Composition Soft Covers features a smooth and soft leather texture that will instantly astonish the person receiving the report. With the option to combine color-coordination or even miss-matching the cover set and channel spine can really bring out the creativity and uniqueness of the project. Select and choose from a variety of colors include black, navy and maroon. Don't just settle on a basic cover, choose the best option that will illustrate your creativity. Let your document speak for itself, and start it with the covers! Welcome to MyBinding Video. These are the Composition Soft Covers from MasterBind. Use these covers to make your report stand apart. They feature a soft texture and a gentle matte reflection under the light. They’re flexible and can bend, but resist folding or creasing, protecting the pages inside. These covers are available in navy blue, maroon and black all in packs of 100. For more videos and all your binding needs, visit MyBinding.com.